This is my first piece. I had only 5 classes. I think that every angry person should do stained glass. BECAUSE IT’S SO CALMING. I simply fell in LOVE. My next piece is already underway. It’s a lot bigger. I will share that with you when completed. 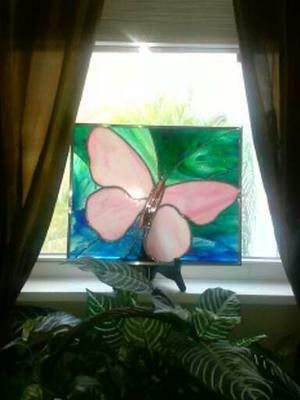 There is no end to stained glass…… Thanks so much Frannie…. That is so lovely, and only five classes. Fantastic. The world is your oyster now… which is just as well, because you’re in LOVE and you will never want to stop! The choice of background glass is great, with its movement and different levels of light and dark. I also love the way it goes from green to blue, then blue to green as you follow it around. Funnily enough, I just asked the people WHY they did stained glass, and one of the things that kept coming up for them was ‘it calms them down’. Thanks again for your photo, and I look forward to your next piece.